A new feature has been added to the Analytics Edge Core Add-in for Microsoft Excel: the ability to copy results directly to a Google Sheets file. This provides a simple solution to client reporting for Excel users. Since the queries are run from your PC, and only the data is written into Google Sheets, you maintain security and control. The free Google Sheets application files can be shared directly with clients, or for more sophisticated presentations, they can be used as a data source for Google’s Data Studio reporting solution (also free). 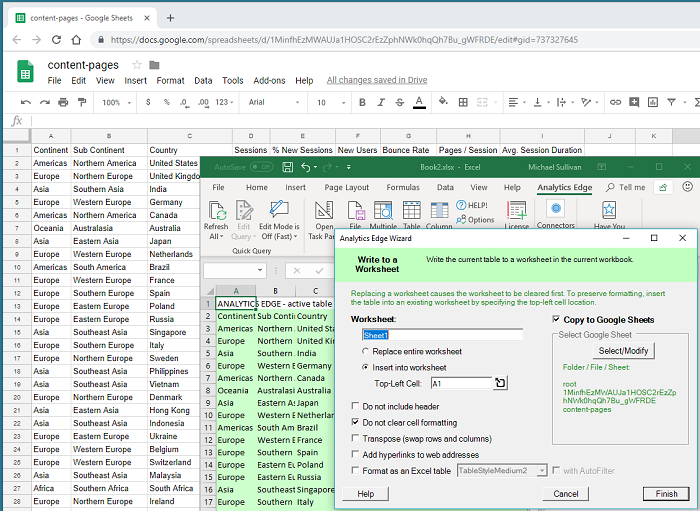 Now you can use data from any of the Analytics Edge connectors to populate Google Sheets reports for your clients — all from your PC! Combine data from Google Ads, Facebook Ads and Bing Ads, as well as MailChimp and Constant Contact, Google Search Console and of course Google Analytics. Simple report automation for Microsoft Excel…now extended to Google Sheets! Available in v6.5.0 of the Analytics Edge Core Add-in. Upgrade today!